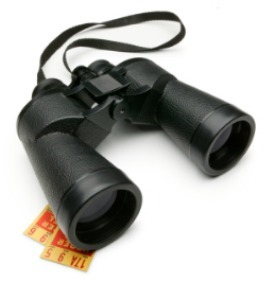 The first factor you need to consider when choosing binoculars for sporting events is the size of your binoculars. Bleachers do not provide enough space to set up a tripod, which means you’ll frequently be holding up your binoculars throughout the game. Using compact, light weight binoculars like Nikon’s Eagleveiw will reduce wrist, neck, and shoulder fatigue so you can focus on the excitement of the completed pass at the far end of the field. Long range or high magnification binoculars often cause jumping images when moved, making them difficult to use during sporting events. While they provide excellent clarity, the field of view they offer is narrower and these specialized binoculars can be difficult to focus. Binoculars with a magnification of 6 - 8 are strong enough to let you see the action at the end of the arena with a field of view that allows you to see most of the width of the playing field. Because sports fans often spend several hours in rain and snow, waterproof binoculars are a must and the seal that keeps water out also protects against dust in windy conditions. Investing in fog proof lenses will reduce muddled acuity, allowing you to view sporting events during inclement weather. The Bushnell H20 Porro Prism binocular combines both waterproof and fogproof features ideal for sports and outdoor enthusiasts. Sports fans are notoriously active, often standing to boo the ref, cheer the star player, react dramatically to bad calls, or trample over other fans to grab a hot dog or nachos. All this movement can result in binoculars being knocked over, dropped, or otherwise damaged. Purchasing a shock resistant binocular like the Steiner’s Safari Professional, designed for increased durability and life span, will protect your optics in a crowded arena full of enthusiastic and rambunctious fans. Additionally, investing in small, portable binocular accessories like EyeShields block glare, dust and other weather distractions, increasing clarity so you don’t miss that once-in-a-lifetime touchdown. Call the play for a better view and order EyeShields from Field Optics Research before the big game.